If you are a runner, there's a good chance you've suffered from "runner's knee" at some point. While the pain originates in the knee joint, there's another joint not too far away that can help combat this pain... the hip joint. New research suggests that rehabilitation exercises incorporating the hip - instead of just the knee - can help alleviate this patellofemoral pain, or runner's knee. Performing exercises to build strength and endurance in the hip muscles led to decreased knee pain and improved joint function when compared with therapy focused on quadriceps muscles alone. Using heavy weights to strengthen hip and glute muscles proved beneficial over the long-term. 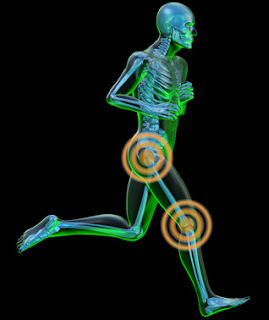 Alternating movements/reps between the knee and hip while performing rehab exercises was associated with reduced pain and improved function. If your knee pain is constant or severe, contact us.